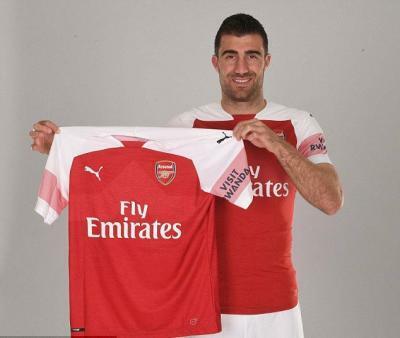 New Arsenal defender Sokratis Papastathopoulos said he was joining “one of the three biggest teams in the Premier League” as he joined the club from Borussia Dortmund. The Greece international, 30, joined for an undisclosed fee for what the Gunners describe as a “long-term” deal. Prior to making 186 appearances for Dortmund he played for Werder Bremen, Genoa and AC Milan. “I feel very good, everything is special,” Papastathopoulos said. He told Arsenal’s website: “It is a beautiful moment and I am very happy that for the next years I will be here. Arsenal are one of the three biggest teams in the Premier League. Papastathopoulos, who has 79 caps, will wear the number five shirt for the Gunners. He becomes Arsenal manager Unai Emery’s third signing since taking over from Arsene Wenger in May. Papastathopoulos will link up again with former Dortmund team-mates Pierre-Emerick Aubameyang and Henrikh Mkhitaryan. “They called me not every day but a lot of times telling me to come here,” he said.